Not quite as flashy as nice shiny espresso machine, pour over drip coffee is a simple way to get high quality consistent coffee. Elegant without being difficult, drip coffee is a great alternate way to serve coffee in your shop either as a first step into serving coffee, or an alternate to your big bold espresso behemoth. The drip coffee is one of the cleanest ways to draw out a coffee’s best qualities, the outcome will differ from a machine producing the same cup, being noticeably more delicate than the standard drip machine. You need to ensure that you grind your coffee beans as close to brewing as possible, to prevent the coffee breaking down and ensure you get the best tasting cup possible. Here’s how to go tech-free. Step 1. Bring your kettle to the boil with twice as much water as you’ll need for the actual brewing (approx 600-700ml). Step 3. Grind your coffee whilst the kettle/water is boiling. For reference, you should aim for your coffee to be as coarse as sea salt. Step 5. Pour approx 300ml of your hot water into the dripper (with filter), this should fully soak the filter paper and warm up the dripper, whilst also heating your cup or jug. The remaining water needs to sit for a while longer until around 90°C. Don’t forget to empty your now-warm cup/jug after a few minutes. Step 6. Now it’s time to pour in your coffee into the filter. 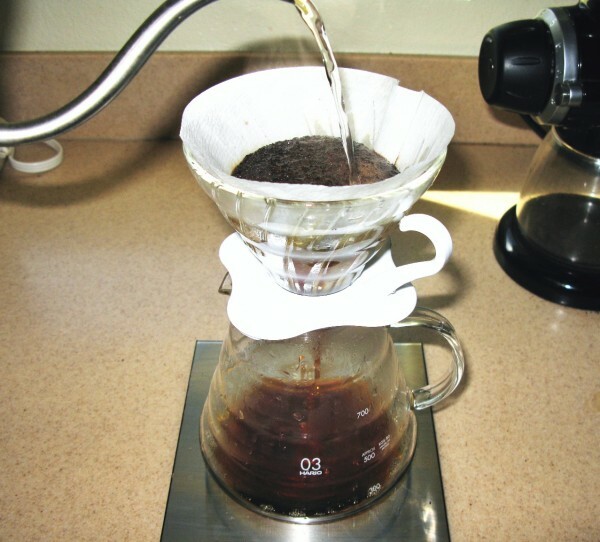 Give the dripper and filter a slight shake to flatten the ground coffee – this will ensure a more even pour. Step 7. It’s pour time. Pour the hot water directly into the centre of the coffee bed. Pour twice as much water per the amount of coffee used – for example 40g of water for 20g of coffee – continue pouring for around 30 to 40 seconds whilst avoiding pouring directly into the sides of the filter. Step 8. Continue softly pouring into the centre of the ground coffee for around two to three minutes. Hopefully if you have followed the steps correctly, you should have achieved an exceptional pour over drip coffee concoction. A very different taste to a coffee with a more traditional espresso base, but with just as many taste nuances as the smaller, stronger relation. If you have the time and the patience, this is a great way to increase your coffee repertoire.